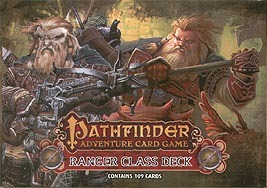 Range far and wide with the Pathfinder Adventure Card Game Ranger Deck!. Explore four different Ranger archetypes in this 109-card set, from mage-hating Arabundi to keen-eyed Harsk. The Ranger Deck is packed with new animal allies, weapons, spells, and other goodies to take your character all the way through any Pathfinder Adventure Card Game Base Set, or Pathfinder Society Adventure Guild Organized play campaign. Hunt on! This deck is not a stand-alone game. It is an accessory for use with any Pathfinder Adventure Card Game Base Set.